It's going to get hot ... really hot. Get ready for another late-summer blast from the furnace next week. Forecasters are saying the high temperatures and humidity this week that pushed the heat index into the 100s, look to return by the middle of next week and stick around for a little while. Philadelphia public school students had half-days Tuesday through Thursday this week to keep them safe from the heat, as many classes lack air conditioning. Tens of thousands of students across the Philly region will end their summer vacation and return to school next Tuesday, just in time for the return of swelter. 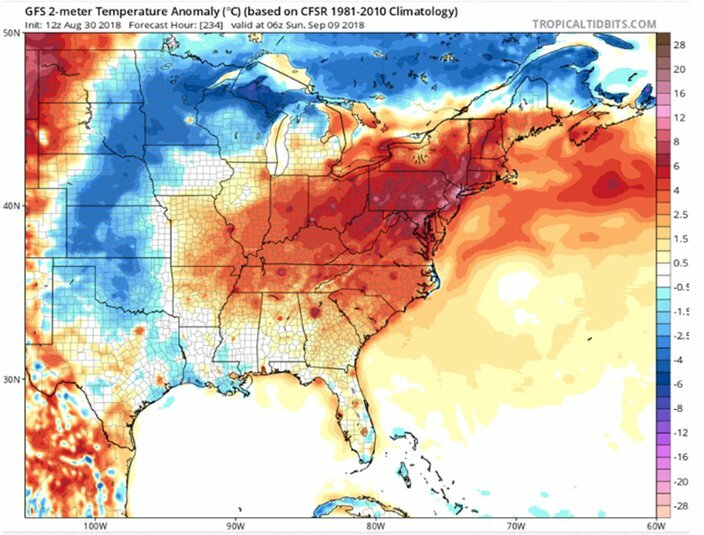 According to Weatherboy.com, the hottest temperatures and most excessive humidity will set up midweek along the I-95 corridor. Combined with high humidity values, the first 10 days of September may feel more like what one would expect during the first 10 days of August. According to the National Weather Service, high pressure will remain dominant through most of next week, with chances for rain and thunderstorms each afternoon, including the Labor Day holiday. That ridge of high pressure will continue to strengthen through the week, with potential for above normal temperatures. 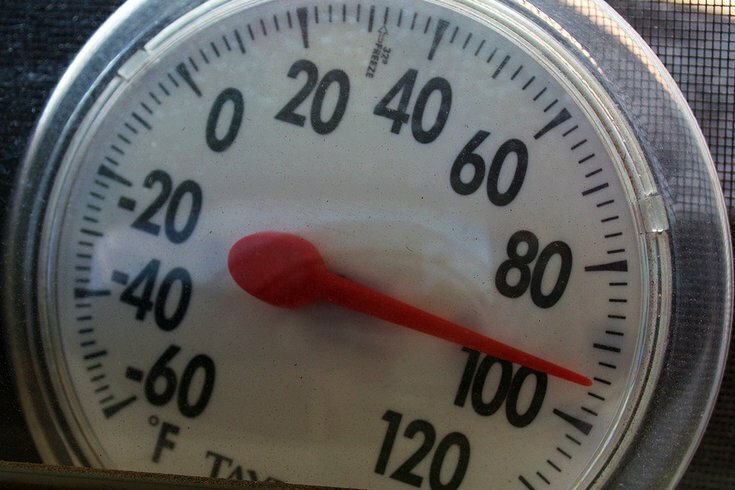 High dew points will result in heat indices in the mid-to-upper-90s, probably through next Friday, when another cold front is expected to arrive, forecasters said. Meanwhile, a chance of showers and a few thunderstorms are likely in the afternoon and evenings through the holiday weekend. Thursday night: A chance of showers, mainly after 2 a.m. Increasing clouds, with a low around 72. Northwest wind 6 to 8 mph becoming northeast after midnight. Chance of precipitation is 30 percent. Friday: Scattered showers before 10 a.m., then scattered showers and thunderstorms between 10 a.m. and 2 p.m., then showers likely and possibly a thunderstorm after 2 p.m. Cloudy, with a high near 79. Northeast wind 8 to 13 mph. Chance of precipitation is 60 percent. Hot weather. That is what one weather model sees for the Philadelphia region on September 9 – about 13 degrees hotter than the average temperature for the date. Friday night: Showers likely and possibly a thunderstorm before 8pm, then a chance of showers and thunderstorms between 8 p.m. and 2 a.m., then a chance of showers after 2 a.m. Mostly cloudy, with a low around 69. East wind 7 to 9 mph. Chance of precipitation is 60 percent. Saturday: A chance of showers, with thunderstorms also possible after 8 a.m. Mostly cloudy, with a high near 81. East wind around 7 mph. Chance of precipitation is 40 percent. Saturday night: A chance of showers and thunderstorms before 8 p.m., then a slight chance of showers. Mostly cloudy, with a low around 71. Southeast wind 3 to 5 mph. Chance of precipitation is 30 percent. New precipitation amounts of less than a tenth of an inch, except higher amounts possible in thunderstorms. Sunday: A chance of showers and thunderstorms. Mostly cloudy, with a high near 86. Chance of precipitation is 40 percent. Sunday night: Mostly cloudy, with a low around 72. Labor Day: A chance of showers, with thunderstorms also possible after 2 p.m. Partly sunny, with a high near 88. Chance of precipitation is 30 percent. Monday night: A chance of thunderstorms before 8 p.m. Partly cloudy, with a low around 73. Chance of precipitation is 30 percent. Tuesday: A chance of showers and thunderstorms after 2 p.m. Mostly sunny, with a high near 90. Chance of precipitation is 30 percent. Tuesday night: A chance of showers and thunderstorms. Partly cloudy, with a low around 73. Chance of precipitation is 30 percent. Wednesday: A chance of showers. Mostly sunny, with a high near 89. Chance of precipitation is 30 percent. Thursday night: A chance of showers, mainly after 2 a.m. Increasing clouds, with a low around 73. South wind 5 to 9 mph becoming light and variable. Chance of precipitation is 30 percent. Friday: Scattered showers, with thunderstorms also possible after 10 a.m. Cloudy, with a high near 78. East wind 10 to 15 mph. Chance of precipitation is 50 percent. Friday night: A chance of showers and thunderstorms. Mostly cloudy, with a low around 71. East wind 9 to 14 mph. Chance of precipitation is 40 percent. Saturday: A chance of showers, with thunderstorms also possible after 8 a.m. Mostly cloudy, with a high near 80. East wind around 9 mph. Chance of precipitation is 40 percent. Saturday night: A chance of showers and thunderstorms before 2 a.m., then a slight chance of showers. Mostly cloudy, with a low around 73. East wind 5 to 8 mph. Chance of precipitation is 30 percent. Sunday: A chance of showers, with thunderstorms also possible after 8 a.m. Partly sunny, with a high near 83. Chance of precipitation is 40 percent. Labor Day: A chance of showers, with thunderstorms also possible after 2 p.m. Mostly sunny, with a high near 84. Chance of precipitation is 30 percent. Thursday night: A chance of showers, mainly after 4 a.m. Mostly cloudy, with a low around 62. Northeast wind around 7 mph. Chance of precipitation is 30 percent. Friday: Scattered showers before noon, then scattered showers and thunderstorms between noon and 4pm, then scattered showers after 4 p.m. Cloudy, with a high near 68. East wind around 6 mph. Chance of precipitation is 40 percent. Friday night: A chance of showers before 8 p.m., followed by a chance of showers and thunderstorms. Chance of showers after 2 a.m. Mostly cloudy, with a low around 63. Southeast wind around 7 mph. Chance of precipitation is 30 percent. Saturday: A chance of showers, with thunderstorms also possible after 8 a.m. Mostly cloudy, with a high near 72. Southeast wind around 7 mph. Chance of precipitation is 40 percent. Saturday night: A chance of showers and thunderstorms. Mostly cloudy, with a low around 65. South wind around 6 mph. Chance of precipitation is 40 percent. Sunday: A chance of showers and thunderstorms. Mostly cloudy, with a high near 79. Chance of precipitation is 40 percent. Sunday night: Mostly cloudy, with a low around 67. Labor Day: A chance of showers, with thunderstorms also possible after 2 p.m. Partly sunny, with a high near 82. Chance of precipitation is 40 percent. Monday night: A chance of thunderstorms before 8 p.m. Partly cloudy, with a low around 67. Chance of precipitation is 30 percent. Tuesday: A chance of showers, with thunderstorms also possible after 2 p.m. Mostly sunny, with a high near 84. Chance of precipitation is 30 percent. Tuesday night: A chance of thunderstorms. Partly cloudy, with a low around 67. Chance of precipitation is 30 percent. Wednesday: A chance of showers and thunderstorms. Mostly sunny, with a high near 82. Chance of precipitation is 40 percent. Wednesday night: A chance of thunderstorms. Partly cloudy, with a low around 67. Chance of precipitation is 30 percent.